Assignment for advertising class... i think. Do a romantic book cover. So i did the bride of frankenstein, movie poster thing. close enough. it's about 15x20 illustration board. i did a layer of airbrush, then gouache, then a wee bit o color pencils. good fun, and i like the way it came out, mostly. are there copies of this? how can i purchase????? i have been gawking at this online for over a year and found out how to find the artist! That's amazing; James Whale himself would be proud. Reminds me of Gone with the Wind! This is a fantastic piece of art! i am in love!! ♥_♥ it's BEAUTIFUL!! I love it! Most people see movies like that as horror, they forget that there's a romantic perspective to it too. Love the line work too. Just right for the style of the time. Brilliant colours and mood. Beautiful work! Really like the watercolor. You could do a poster for The Invisible Man, another great movie directed by James Whale. Like most people i really like your use of colour and shadows. I also can feel the strong atmosphere of this great film here. this would make such a great tattoo. you REALLY should sell prints of this. I do, just not on DA. They over charger and I get non of the profits. oh yeah? How much do you charge for a printed and shipped copy? I would be very interested in this for the holidays (rapidly approaching). 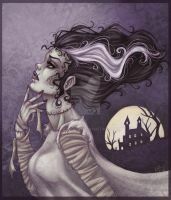 One of my favorite pieces on Deviant art, and would make a wonderful gift. why haven't I seen this yet? it's amazing! Gorgeous. You've got the romance novel look down. Would make a good movie poster too! great piece of art, here. i really really enjoyed this. Excellent work! I particularly love the windmill, and the silhouetted people at the bottom of the page.